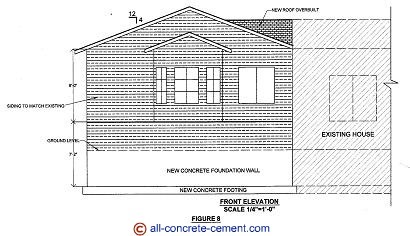 Home addition plans, garage floor plans, room addition blueprints and shed plans are perfect for diy construction plans. These are very simple to do and they do not have to be fancy or complicated. By creating your own plans, you are on your way to learning construction the same way such professionals as architects and engineers do. Construction plans for buildings and houses in most cases are done by Architects - all the exterior elevations, shapes and colors, material used, height, etc are done by architects. Structural engineers are responsible for making the structures that created by architects safe for the occupants and the public. Both architects and engineers are extremely knowledgeable in matters related to construction because of their knowledge of the plans they created. You can learn construction the same way architects and engineers do by creating your own home addition plans or get involved in the process if you hire someone to do it for you. It is pretty simple really, after several years working as a structural engineer designing commercial structures, I decided to learn to draw. All the plans and details shown in this website were skills that I learn on my own and it had helped me a great deal over the years. 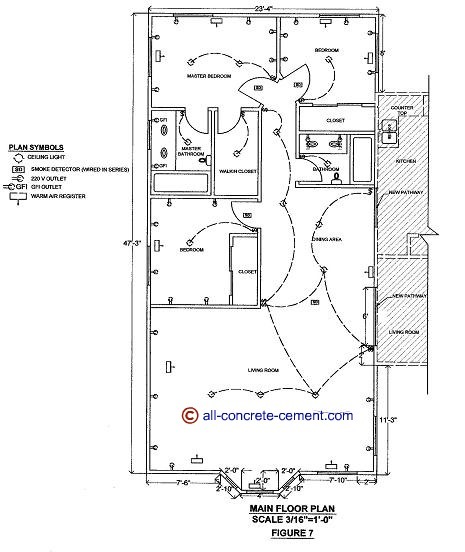 If you want to create plans for your garage floor plans, concrete house plans, shed plans, or an addition to your house, I'll be glad to help in anyway possible. Over the years, I had worked on varieties of projects both residential and commercial. I had drawn plans for new homes, house additions, house remodels, garage additions, sheds, and commercial structure additions & remodels. Figure 6 above is an example of a site plan. Before drawing your plan, you need to get information about your property dimensions from the county assessor's office or their website. This will help you with layout of your lot. On the site plan, you need to show all the structures within your property drawn to scale. There are setbacks requirements that you must follow which will impact how much you can add on to your property. You can get the setback requirements from your county's planning and zoning. Floor plan is an aerial view of your floor.This is where you will arrange your bedrooms, bathrooms, kitchens, living rooms, closets, doors, windows, etc. You can start by sketching the layout of your existing house. This will give you ideas how to access your new addition. The floor plans in figure 7 show electrical work. There are a lot of plans that I have constructed with no electrical or heating shown. Since electrical and mechanical work in most cases are design built, which means your electrical contractor will install these items per code before you call in for inspection. You can opt out and not show any mechanical and electrical on your plans unless required by your building department. You will need elevation views showing the existing house with the new addition attached to it. Elevations need to show front, back, and sides. These views need to show windows, doors, roof slope, wall heights, finished grade, roof finish, etc. Elevation views do not have to be fancy. There is no need to sketch exterior finishes, an arrow with a note such as siding finish or stucco will do just fine. Building section is where details how to construct certain elements are shown. On the building section figure 9 above, the footing, foundation walls, floor slabs, and interior continuous footings for the bearing walls are shown. Though not called out above, the building section is where the reinforcements for the footings and walls are shown. The framing 2x4 @ 16" o.c. studs are shown as well as floor joists and roof trusses. The sketch show a new stud wall built against the existing. The intend was to leave the existing structure undisturbed such that no engineering analysis is required. Missing from the detail was a note to state that existing siding to be removed and reused at the new addition. This will ensure the existing siding is removed, whether the owner decides to reuse it is an entirely different matter. While the sidings are ok to be removed, the wafer board or plywood need to remain as shear wall for the existing house as well as the new addition. 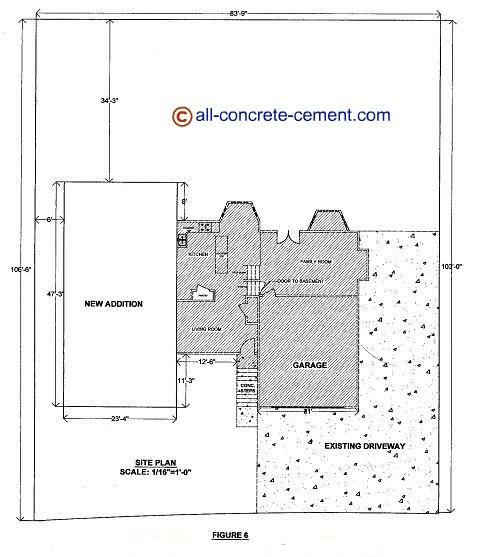 Need help with your home addition plans, email us at info@all-concrete-cement.com. All we need are few photos and and your lot layout and we can create you a room addition or home plans for your addition.